Few pleasures compare to sitting down to a fine meal with friends. In Spain that can mean a simple tapas menu or perhaps a more complicated dish such as paella. But seldom do friends and family meet together over food without wine. Wine is as beloved to Spain as is the Mediterranean sunshine. Wines from Rioja can be enjoyed anytime. Perhaps the best known and loved of the Spanish wines is the wine that comes from the Rioja region. The wines that flow from Rioja are known the world over and for good reason. They are complex, flavorful and robust and a fine way to pass the time. Rioja is located in north central Spain, an hour from the North Atlantic and four hours from the Mediterranean and the grape growing season is a bit longer than other areas of the country. This means the fruit can ripen thoroughly and isn’t harvested before the critical acidity level is reached. Rioja wines are primarily blends based on Tempranillo grapes with Grenache, Mazeuelo and Graciano tossed in for added sweetness and flavor. The region is divided into three growing zones, the relatively cool regions of Rioja Alta and Rioja Alavesa and the warmer and drier Rioja Baja. Tempranillo grapes thrive in the Alta and Alavesa regions while the Baja area with its more Mediterranean climate favors the softer Grenache grape. Red rioja is a blend of all of the four above-mentioned varieties while the white is primarily composed of Viura, Malyasia and Grenache. But really, a geography lesson is all good and well but let’s talk a bit about actually drinking this lovely liquid. The beauty of Rioja wines are the way they go with food. Any food, really. You can pair a wonderful Rioja with almonds, anchovies, bacon, asparagus and olives. Bell peppers, calamari, bread, cheese (especially cheese!) meatballs, chorizo, eggs and eggplant. How about some capers, ham, meatballs, or shrimp? Potatoes, salad, trout and zucchini. And rioja doesn’t need to be paired only with foods beloved by the Spanish. How about Peking duck or chicken satay? Barbecue or pizza? 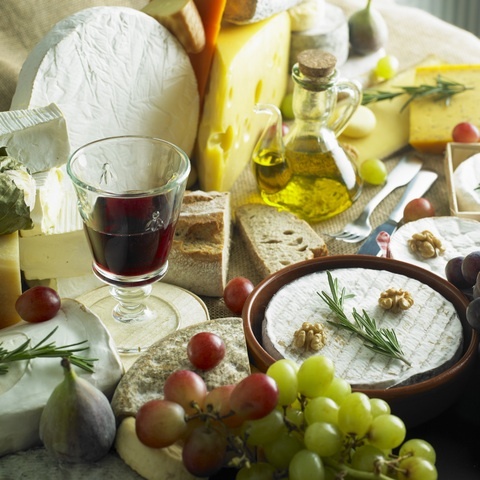 Rioja can be paired with almost any food you love because it is a complement to it and not heavy or overwhelming. So enjoy, drink often and with friends, drink to your health, to your family or simply to a wonderful day. Mmm I hope to someday enjoy some of this wine in the place it was made! There is so much I don’t know about wine, thank you for sharing!